ROME (AP) — A “Made in USA” matchup. 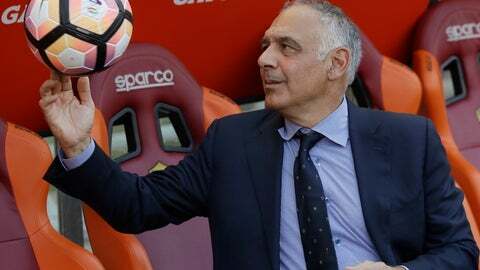 Italian media are promoting Friday’s match between AC Milan and Roma at San Siro Stadium as the first meeting of two American-owned clubs in Serie A.
Elliott’s takeover had been forecast a year earlier by Roma president James Pallotta, who told The Associated Press in July 2017 that Milan’s transfer market spending spree was beyond the club’s means . Pallotta told SiriusXM last month he believed Gordon Singer, the son of Elliott founder Paul Singer, has the potential to get Milan back. Elliott has promised to swiftly inject 50 million euros ($66 million) in capital into Milan, and its takeover led to the club’s reinstatement in the Europa League following a ban for UEFA financial fair play violations. Like Roma, Milan under Elliott management has installed one of its most emblematic players in a management role within the club, with former longtime captain Paolo Maldini recently appointed sporting strategy and development director. Maldini’s appointment came a year after longtime Roma captain Francesco Totti retired from playing and was given a director’s role by Pallotta. While the obvious goal for the American owners beyond financial stability is silverware, that’s easier said than done. Roma has not won any cups under its current ownership, although it took a big step toward international prominence last season by reaching the Champions League semifinals with a stunning comeback win over Barcelona in the previous round. Despite achieving so much last season, Roma confounded its fans by continuing to sell some of its best players. Warrior-like midfielder Radja Nainggolan was sent to rival Inter Milan for 38 million euros, prized goalkeeper Alisson went to Liverpool for more than 70 million euros, and this week midfield stalwart Kevin Strootman rejoined former Roma coach Rudi Garcia at Marseille for 25 million euros. Taking advantage of big sales has always been the mantra for Roma sporting director Monchi, who Pallotta lured from the Spanish league last year after 17 years in the same position at Sevilla. “There have been some notable departures, but I would say that last year we had the exact same discussions — and in the end we reached the Champions League semifinals,” said Roma striker Stephan El Shaarawy, a former Milan player. Milan effected one blockbuster move that sent defender Leonardo Bonucci back to Juventus with striker Gonzalo Higuain and defender Mattia Caldara moving the other way. In its only match so far, Milan squandered a two-goal lead in a 3-2 loss at Napoli. Roma opened with a last-grasp 1-0 win at Torino than had to come back from two goals down to draw with Atalanta 3-3 on Monday. Roma coach Eusebio Di Francesco was so excited by Kostas Manolas’ equalizer against Atalanta that he broke his hand when he punched the bench in jubilation.